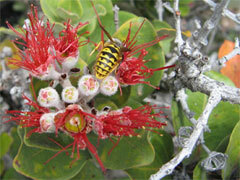 Invasive yellowjacket wasp sips on a native Hawaiian ohia blossom. More photos in a slide show. Photo credit: Erin Wilson. A switch from annual to multiyear colonies and a willingness to feed just about any prey to their young have allowed invasive yellowjacket wasps to disrupt native populations of insects and spiders on two Hawaiian islands, a new study has found. By analyzing the DNA from bits of prey snatched from foragers returning to nests, ecologists from the University of California, San Diego, found that introduced yellowjacket wasps kill or scavenge prey from 14 different taxonomic orders of animals, even reptiles and birds. “They’re consuming anything from geckos to shearwater to tree lice to more juicy items that you would expect them to eat, like caterpillars. They’re just like little vacuum cleaners,” said Erin Wilson, who recently completed her doctorate at UC San Diego and is the lead author of the study reported in the Proceedings of the National Academy of Sciences this week. Wilson and her colleagues found that nearby populations of caterpillars and spiders rebounded when wasp nests were removed. Erin Wilson and assistant capture yellowjackets as they return to the nest with food. Photo credit: John Wilson. Existing traits, like a flexible diet, can explain why some transplanted species become invasive, but the way a new environment might alter the invader’s behavior is seldom considered, the authors say. In their native range, Western yellowjackets (Vespula pensylvanica) nearly always form nests in the spring that become dormant before winter. In Hawaii’s mild climate, however, up to 20 percent of colonies persist for years, grow to enormous sizes and have become major pests. One colony on Maui had as many as 600,000 individuals, compared to the usual size of a few thousand wasps. “Rather than having a nest the size of a football, you’ll have a nest the size of a ’57 Buick,” Wilson said. “Our largest colony had four nest entrances that were just like fire hoses of wasps coming in and out.” More than three times as many foragers return to perennial nests each minute compared to annual nests, the researchers found, most of them bringing food. The sheer numbers are changing the ecology of Hawaii’s endangered ohia woodlands and subalpine shrublands. 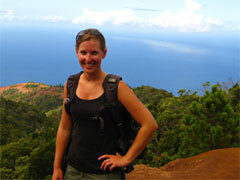 Erin Wilson traveled to Hawaii to study invasive wasps. Photo courtesy of Erin Wilson. 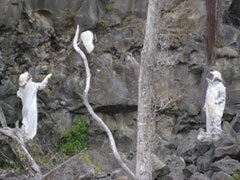 In the fall of 2006 and 2007 Wilson traveled to Hawaii Volcanoes National Park on the island of Hawaii and Haleakala National Park on Maui to study the wasps. Adult wasps mostly consume nectar, but collect protein-rich food for their developing larvae and carry it back to the nest. Wilson and her field assistants plucked bits of food from the mandibles of 500 foragers returning to 10 different nests, five in each park, then sequenced the DNA. “We were able to identify, using genetics, very small prey items,” Wilson said. They compared the sequences to a public database and to sequences they obtained from whole, identifiable specimens collected near the nests to create a comprehensive catalogue of the wasps’ diet. Although wasps will scavenge food from carcasses, more than two-thirds of the confiscated food bits were from freshly killed prey, they found, including native spiders, flies, crickets, bark lice, and Hylaeus bees. 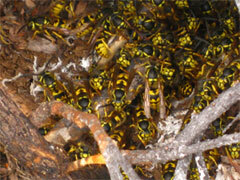 Yellowjacket wasps form huge nests in Hawaii, magnifying the ecological harm. The wasps also eat other introduced insects, which are abundant in Hawaii, such as European honeybees. These fellow invaders may help to sustain larger populations of wasps than the native fauna could, the authors say. When park officials removed colonies, nearby populations of native spiders and caterpillars rebounded. With the yellowjackets gone, spiders increased by 36% and caterpillars increased by 86% they found. Co-authors include biology professor David Holway and Lynne Mullen, a former graduate student at UC San Diego, who now studies at Harvard University. The National Science foundation and the Environmental Protection agency funded the work.